Happy (almost) Halloween! Halloween just happens to be my favorite holiday of the year. Who can resist dressing up in costumes, roaming the neighborhood streets after dark, and eating loads and loads of candy. The only thing I dislike about Halloween is trying to figure out how many trick-or-treaters we will have so I can buy the appropriate amount of candy. I can not tell you how many times we have run low. I take a peek down the street and there’s an army of small children headed our way, each of them eager for Halloween candy. Frantically I tell my husband he must get to the nearest store, Fast!, and buy some more candy! But don’t run over any kids in the driveway! Inevitably he brings back about 10 pounds of candy and by the time he returns, the number of trick-or-treaters has dwindled drastically. Then we have bags and bags of leftover candy. And guess who’s most likely to eat candy until they feel sick to their stomach? (Raising hand sheepishly). Ever since I made this Game Day Pep-Corn with REESE’S Minis, I’ve become obsessed with melting Reese’s Minis to make a drizzle/sauce. It blends all the peanut buttery/chocolate amazingness of a peanut butter cup together into one singular goodness. 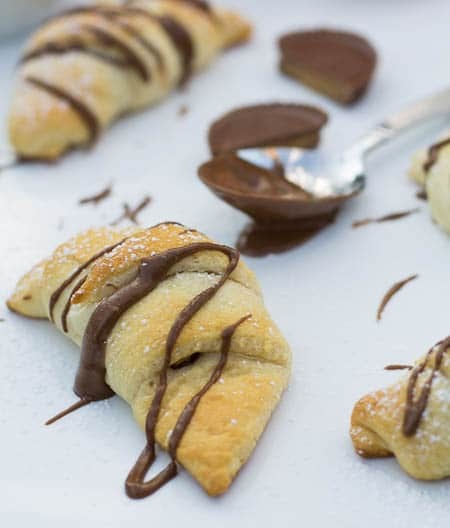 With a peanut butter cup on the inside and Reese’s Mini’s Drizzle on the outside, these are super delicious crescent rolls! I’m teaming up with my friends today to bring you 9 delicious sweet treat recipes. Be sure to check out other tasty treats. 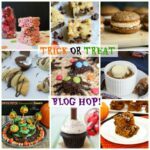 If you dig sweets then check out #TrickorTreatBlogHop on Facebook, Twitter, Google+, Pinterest and Instagram. Don’t all these treats sound amazing? 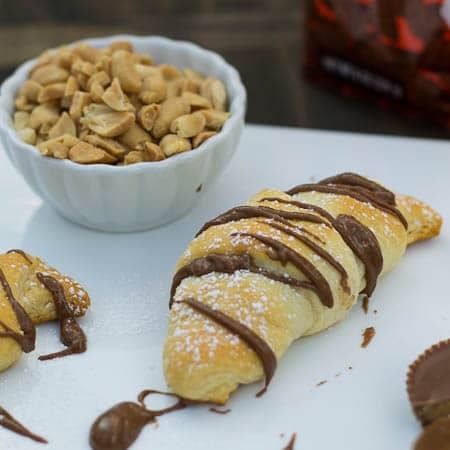 These sweet crescent rolls are super easy to make and a great way to use up Halloween candy! Preheat oven to 375 degrees. Lightly spray a baking sheet with cooking spray. Unroll crescent roll dough and separate into triangles on baking sheet. Place 1 piece of peanut butter cup at wide end of each triangle. Sprinkle with a few peanuts. Roll crescent dough from wide end toward tip of triangle. Place in oven and bake for 11-13 minutes, until light brown and no longer doughy. Place Minis in a microwave-safe bowl and microwave on 50% power for 30 seconds. Stir well. Heat another 30 seconds at 50% if necessary to get mixture smooth. Drizzle melted Minis on crescent rolls and sprinkle with powdered sugar. This entry was posted in Desserts, Snacks and tagged candy, chocolate, Halloween, Peanut butter, Reese's, trick-or-treat. Bookmark the permalink. Whoa! Now these are some seriously amazing rolls! Happy Halloween, Christin! If only people would hand these out… I’d definitely be out trick-or-treating frantically. Hahah what a cute twist on pain au chocolat! Oh man, I’ve never thought to melt minis to make a sauce! That’s such a good idea! We always have candy leftover so this year I only bought peanut butter cups since they’re my favorite. Although I’m not sure if that was a good or bad decision… haha But at least I can make some crescent rolls with the leftovers! Christin I love pastry treats, and these look amazing! That drizzled chocolate on top knowing inside is hidden with a Reese’s Peanut Butter cup, my mouth is watering! I have the same problem! Not enough candy? Too much candy? The right candy?? I think I’ll err on the side of too much candy so I can make these cuties! Hope you have just the right amount left over! 🙂 Happy Halloween! I’m not sure I would ever be able to make these because I always eat all the Reese’s before I get a chance to make something with them. But I definitely need to save some to make these crescent rolls. They are the perfect size for a sweet treat. Thanks for sharing, Christin! I know what you mean Ashley! My daughter and I just opened a big bag of candy we bought for the trick-or-treaters, and we ate every single one of the Reese’s out of it! I used Pillsbury refrigerated crescent roll dough. They bake up really buttery sort of like croissants, but not really. Next best thing would probably be refrigerated biscuit dough if that is available to you, but you’ll have to improvise on the shape. I would pull each biscuit apart and make a top half and bottom half and sandwich the reese’s in between. I might have to try that come to think of it! It sounds really good. 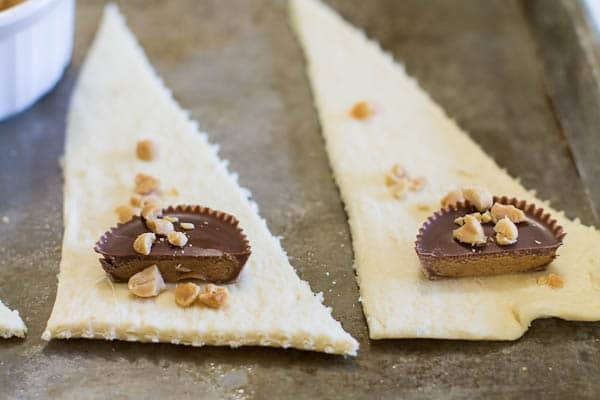 You could also use pizza dough rolled out and cut into triangles. What a great recipe–simple yet so creative! Will definitely be making these soon. Thanks for sharing! Hope you have a wonderful Halloween Pamela! We moved into our neighborhood last year and ended up with all the candies! We got no trick-or-treaters here so I ended up baking with those candies. This year, I’m hoping it’ll be different. But we’ll see. 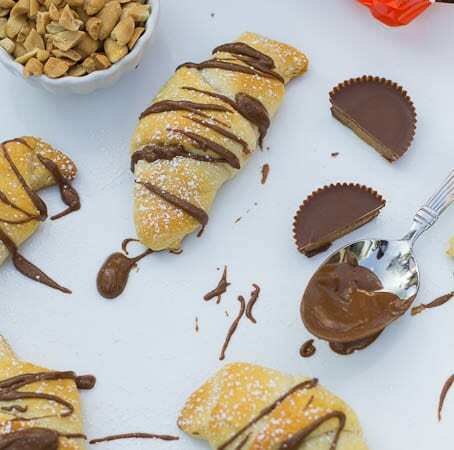 I love this idea of using Halloween chocolates in crescent rolls. It takes breakfast to a whole new level! 😉 Happy Halloween Christin! It seems like neighborhoods either get loads of trick-or-treaters or hardly any. We live in a fairly new neighborhood and lots of houses have been built in the last year as the real estate market has picked up, so I have no idea what to expect! I’ve already had my Halloween though. Ate tons of candy yesterday and I am d-o-n-e! 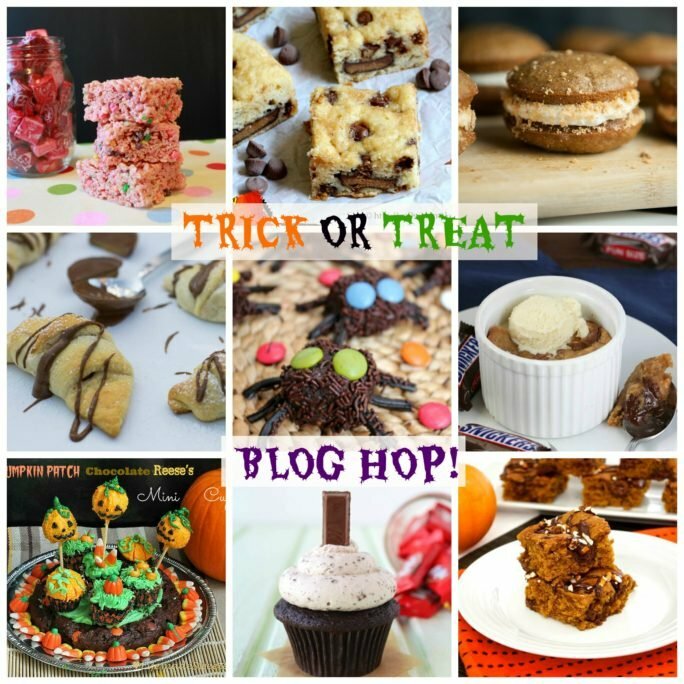 Have a wonderful Halloween Anne and thanks so much for helping organize this blog hop! Nope, I wouldn’t complain about eating all the candy myself either! Enjoy! What a creative use of crescent rolls! I especially love that you drizzled melted mini Reese’s on top of these — so decadent and delicious! Wow! What a great idea! Never thought about doing this with Reese cups. OMG I would kill for one of these babies right now!!! They look so good Christin! This is amazing and so original. My mouth is watering just looking at them. Pinning! Hehe, we’ve run low on candy a couple of times too and my hubby has had to run out to go pick up some more at the store and we end up with way too much leftover candy too. These crescent rolls sound incredible! 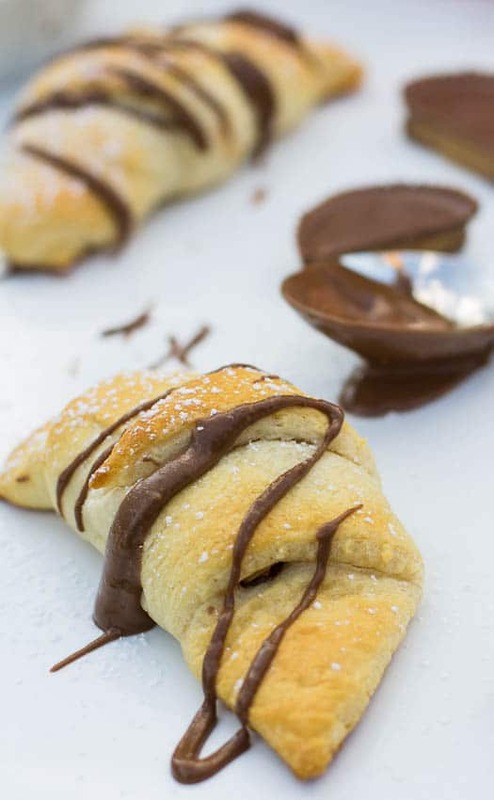 What a great way to use up Reese’s and who wouldn’t love chocolate and peanut butter rolled into a gorgeous pastry for breakfast? I love that you drizzled them with extra melted mini’s to make these super special! Pinning and hope you have a fabulous Halloween Christin! These look mouthwatering good, Christin! Reese’s are one of my favorite candies. I’m really going to have to branch out and make a sweet version of Crescent rolls next time I make them. I hate trying to figure out how much candy to buy as well. I’m going with less this year and hoping it’s enough! Happy Halloween! Happy Halloween to you too Marci and thanks so much for inviting me to this blog hop. I can’t wait to try your Pumpkin Rolo Blondies!